For nearly two centuries, Bedford Springs Resort, in the Allegheny foothills near Bedford, Pennsylvania, was a legendary hotel, a grande dame that sheltered and entertained the country’s elite. Seven sitting U.S. presidents stayed here (President Reagan being the last), and President James Buchanan made it his summer White House in the mid-1800s. He received the first transatlantic cable here, from Queen Victoria. Captains of industry such as Henry Ford and John Wanamaker came here to “take the waters” of the spa resort—and to socialize, of course. The spa was popular with debutantes, and high-profile nuptials were conducted in the hotel ballroom. The weddings spawned a quirky tradition–brides etched their initials in the window glass with their diamond rings. Today, those window panes are on display in the newly opened resort. The survival of these fragile mementos is a bit of a miracle, because the aged hotel closed in the 1980s and was abandoned until new owners with a passion for the place came to its rescue. The hotel’s survival is also a tribute to the community, because there was no vandalism during the hiatus. The town’s people have proudly queued up to work at the hotel, and the town itself is undergoing a facelift. 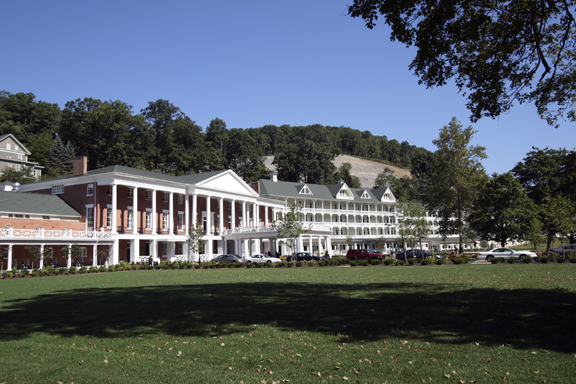 Following a three-year, $120 million restoration, the Bedford Springs Resort reopened in July 2007. Today it looks almost exactly as it did in the 19th century, with three tiers of porches stretching along graceful white wings on either side of the Greek Revival-style portico and the Doric columns soaring above it. Ancient oaks cast their shade upon gardens and expanses of thick grass. A stone path runs along the front of the hotel, past the new spa wing to the gazebo where golf carts are staged. The expansive lawn blends into the tees for the first hole, next to the meandering Shober’s Run, a constant presence throughout the course. Golf was relatively new to the country when Spencer Oldham designed the Bedford Springs course in 1895. Over the next three decades, architects A.W. 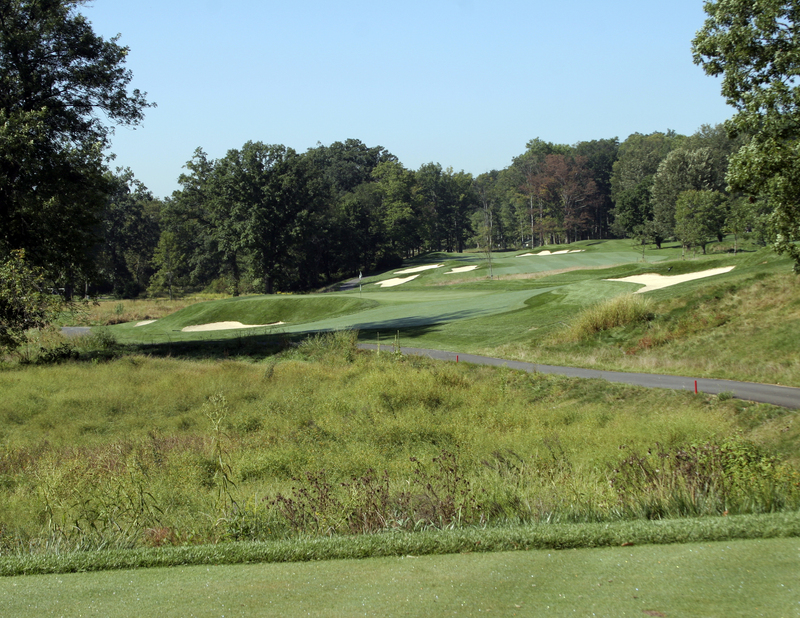 Tillinghast and Donald Ross added their nuances. Some of the country’s oldest golf holes in continuous play are here, because the county kept the course going during the years the hotel was closed. Today’s layout scarcely resembles the tired track that was in play when the new owners took over—except for the 200-year-old oaks and massive maple trees lining the fairways. The course renovation was as exacting as that of the hotel. Cores were dug to determine and restore the exact path of Shober’s Run, the shape of greens, and the bunkering. The result is a delightful series of challenges that play just as they did a century ago. It doesn’t look hard. The fairways are wide and relatively flat, but if you stray from the short grass the second cut is thick and wiry, the mounds are clothed in tall fescue that steals balls, and diabolical bunkers lie in wait. Most of the greens are small and sculpted and often surrounded by contours that will give your approach shots unexpected kicks. Fog draped the course when we first teed off, and after a few holes I was so caught up in the history I expected to see players in plus-fours emerge from the murk. 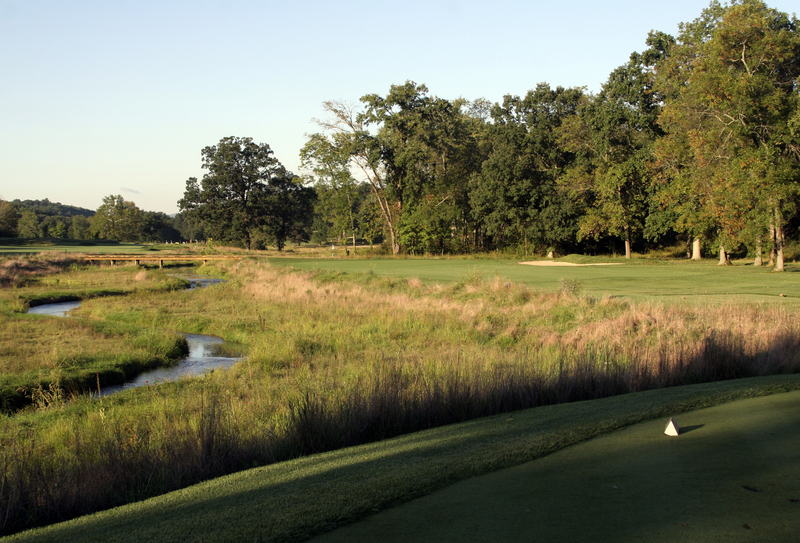 The second hole, a par three named for its creator, Spencer Oldham, has been in play since 1895. It’s shaped like a boomerang, with wetlands along the inner side and a lone bunker lurking on the far edge of the side-sloping green. The fourth hole, another par three (there are five of them, and five par fives) is a 1923 Ross design aptly named Volcano. Ranked the number one handicap, it’s 223 yards from the back tees and demands at least two more clubs than your usual to reach the summit. If you land short of the narrow, deep green atop the mound, your ball will tumble back down 20 feet or more to slope-side bunkers. Hole 13 is a 615-yard gauntlet of mounds and bunkers, including a St. Andrews Hell Bunker look-alike in the second landing area. The green is sharply canted to send balls toward two flanking bunkers. Its name: Long. Albeit a famous one, the next hole can be an easy par, depending on pin placement relative to the ridge running through the small, kidney-shaped green. A Tillinghast gem named Tiny Tim, the par three is fronted by a lagoon and surrounded by conical mounds the architect called the Alps. I usually shy away from hole descriptions, but the holes are so distinctive . . . well, just one more. Hole 17, a Tillinghast 174-yard par three, vanished from the layout in the 1970s but has been restored. It drops from the tee over wetlands to a green jutting from the hillside and sloping toward two deep bunkers. The natural impulse is to aim for the base of the hillside at the front of the green, but there’s a big bunker there, and the hillside itself sends balls caroming across green. Hole 18, Home, also disappeared in the 1970s, but is now a beautiful par four riddled with bunkers guarding a hilltop green. The course is walking friendly, as is the resort, with paths leading to the seven medicinal springs that were used by native tribes long before recorded history. 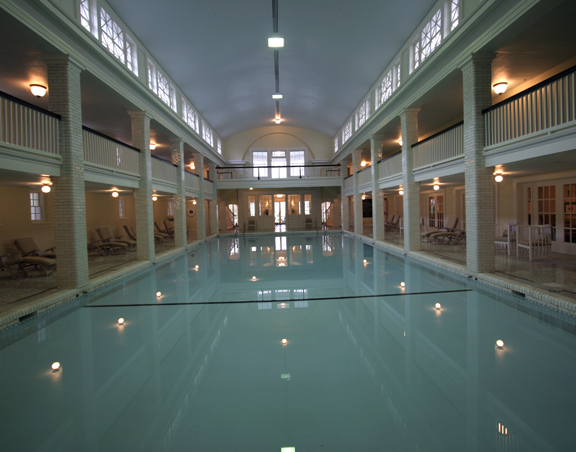 The healing waters have been the hotel’s raison d’etre since 1809, when it opened as a 24-room inn. Expanding as its popularity grew, by the 1850s Bedford Springs became known as the “Carlsbad of America,” after the famous spa in Europe. Passing through the hotel doors was like stepping into a time warp. The wallpaper, fabrics, furnishings and signage are true to the hotel’s time period, as are the wood floors and rich area carpets in the expansive common areas. Artifacts have been gathered from area collectors, providing fascinating browsing. An array of old hats occupies a display case just off the grand stairway, and the original registry books are in the lobby. The old lobby bar is now used for afternoon tea, a pleasant ritual made even more so by the comfortable seating areas by the fires, or the option to take a “cuppa” out onto the porch in warm weather. Historic black-and-white photos and artwork adorn the halls, common areas, meeting rooms and 216 rooms and suites. Guest rooms have period touches such as goose down comforters, armoires, standing Chevalier mirrors and marble-tiled bathrooms. Each room on the front of the hotel has a pair of bentwood rockers on the porch. Modern features added during the restoration are unobtrusive–state-of-the-art plumbing, electricity, heating, cooling, fire protection, phones and Wi-Fi. The ground level of the hotel holds five diverse restaurants and two bars, each reflecting the era during which that section of the hotel was built. Chandeliers in the Crystal Room light a cozy, elongated space with serene blue wallpaper and dark wood paneling. Images of former guests in period garb smile down from every wall. Three meals a day are served here, starting with breakfasts that range from Amish apple pancakes to eggs Benedict. The 1796 restaurant offers an extraordinary dining experience surrounded by thick stone walls, antique glass and artifacts from the hotel’s past. Open only for dinner, the 1796’s seasonal menu features dishes such as foie gras, buffalo, trout, venison loin, and sublime steaks paired with fine wines. Overlooking the garden is the three-tiered Frontier Tavern. Its light sandwich menu includes great burgers and buffalo wings, accompanied by good brews on tap and an extensive selection of wines and mixed drinks. Seamlessly bonded to the original structure is a new wing housing the 30,000-square-foot Spring Eternal Spa and the 1905 spring-fed pool, one of the country’s first indoor swimming pools. Spa treatments are preceded by a relaxing ritual in the Bedford Baths that starts with a powerful, multi-headed shower followed by alternating dips in a jetted hot pool and a cold plunge pool. A new outdoor pool lies to the rear of the spa wing, overlooking the eighteenth hole of the golf course. There are also tennis courts on the grounds and miles of trails on 2,200 acres for hiking, biking, horseback riding and cross-country skiing. Gold medal trout streams lie nearby, as well as rafting rivers, covered bridges, and historic homes and villages. The 185-acre Bedford Springs Hotel National Historic District includes 22 structures that date back to the 1790s. It’s so important to the state that it committed $24.9 million to the restoration and rerouted a major highway around the historic landmark. 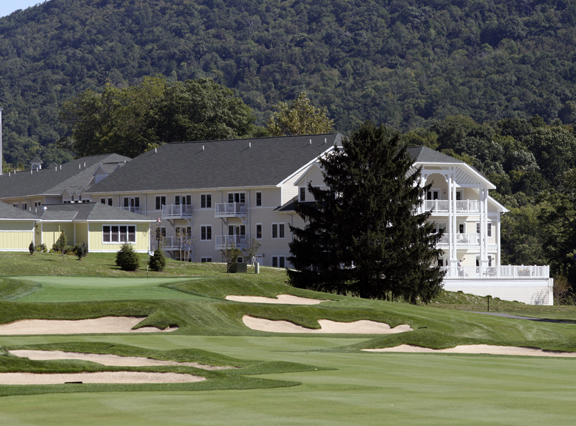 Bedford Springs Resort is two hours from Washington, D.C., near the Pennsylvania Turnpike. For more information, visit www.bedfordspringsresort.com or call (866) 623-8130 or (814) 623-8100.